Taylor Sawmill is located on Manitoulin Island. It is a family business owned and operated by Gail Taylor and his wife Roslyn. Established in 1980, we have grown each year to date. 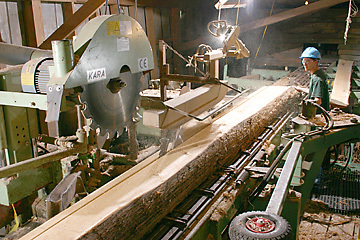 In 2002, the actual sawmill, that processes the logs, was replaced with a new circular saw from Finland. A new Wadkin moulder was installed in 2003. We then acquired a second, "state of the art" computerized moulder from Germany in 2005. To compliment this fine equipment, we use a profile grinder enabling us to design, manufacture and maintain our own planer knives. We also operate a 10,000 board ft. capacity dry kiln. Premium Northern White Cedar and White Pine specialty products comprise the majority of our production. Select and common grade red oak, hard maple, ash and birch are available kiln dried and rough sawn, dressed four sides or as trim and moulding. We do not consider any order too small, because we have built our business on personalized service. Large volume production has never been a goal. We strive to produce the best quality lumber available. Taylor Sawmill has supplied the interior plank panelling for fine restaurants as well as the interior walls, ceilings, floors and exteriors of many very elaborate homes and cottages on Lake Huron and Georgian Bay. Retail orders are always welcome. We have arranged reasonable transportation rates throughout Ontario with Manitoulin Transport. Since our latest expansion, we are considering setting up lumber retailers with our product line. During 2002-2003 we developed a line of beautiful modular "Island Cedar Saunas", which have become very popular. And since most families eventually outgrow their cottage, we also designed a modular sleep cabin that we call the "The Island Bunkie".